Vegetable fritters are a popular way of preparing vegetables in Mexico, particularly during Lent. They also accompany simple chicken and fish dishes such as huachinango a la talla. 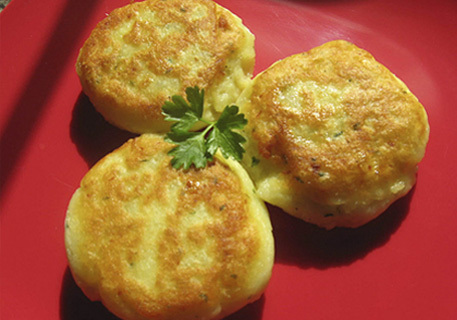 These potato patties can be served with a fesh salsa mexicana or a cooked salsa. - Cook the potatoes in boiling salted water for about 20 minutes or until they can easily be pierced with a fork. Drain, peel and mash the potatoes well. Knead the potatoes with your hands, working in the grated cheese. Form into 3-in (7.5-cm) patties. - In a bowl, beat the eggs lightly and stir in the pepper. Dip both sides of the patties into the beaten eggs. - Heat the oil in a large skillet until very hot. Add the patties 2 at a time and fry on both sides until they are lightly browned. Sprinkle lightly with salt and drain. Serve hot or at room temperature.